In Religion and the Snow Cone Universe I explored the essential function of religion as a way of connecting (religare, tie together) the inner and outer realms of human experience. Our mystical communion with the grounding mystery is metaphorically represented and depicted across a collection of sacred stories known as mythology. These myths (mythos, narrative plot) are recited by the community in ritual performances and worked out in daily life according to the local customs and precepts of morality. A critically important qualification in all of this is that the mythology of religion must align with our current understanding of the cosmos. When it does, our spirituality (inner realm, grounding mystery) can flow out and connect meaningfully with our science (outer realm, cosmic order), generating an awareness that everything “turns as one” (universe). When this alignment is missing, our myths become incredible and increasingly irrelevant. Rather than being able to inhabit our stories, enacting them and living them out, we are left with the choice of taking them literally as eye-witness accounts of supernatural and miraculous events of the past or tossing them aside as so much childish superstition. I will build a case that religion evolves as human beings develop, which means that the larger cultural shifts we observe across the centuries are deeply correlated to changes unfolding (or arrested) at the individual level of human consciousness. 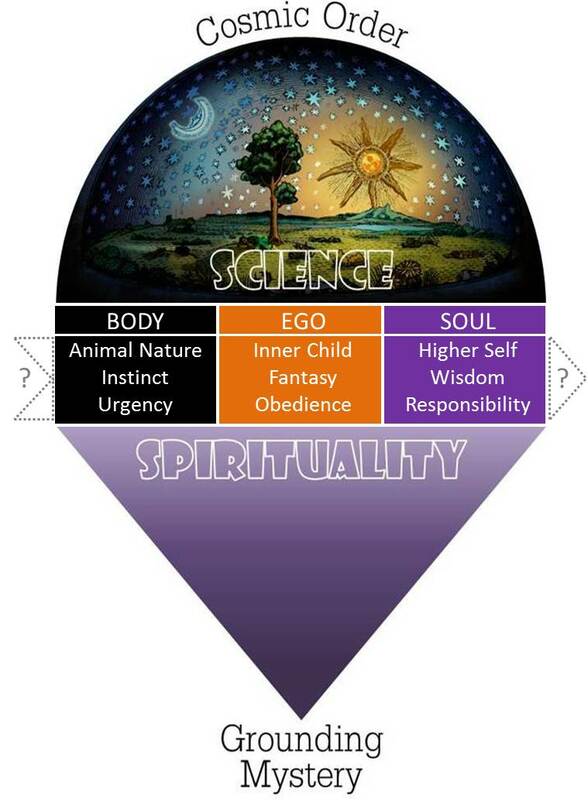 The above illustration is pulled forward from my most recent post (Religion and The Snow Cone Universe), but in place of the word “religion” I have inserted a graphic representing what I will explain as three stages in the evolution and organization of consciousness. “Stage” here will be used in two senses of the word: as a developmental period of time and as a kind of platform (think theater stage) that provides consciousness with a specific vantage point on reality. Thankfully we don’t need to do a lot of research or dig into cultural archaeology to start making sense of these stages I have in mind, for they are represented in the very structure of your consciousness as a human being. Just as your individual development is unfolding according to a sequence of distinct stages, so religion has been evolving along that same advancing line. So, I’ll ask you to sit back and take a look at yourself. Let’s just get the hard fact out of the way: You’re an animal. You breathe, burp, and bleed just like other animals. You were born, grew up, and one day you will die – just like other animals. Inside and under your skin is a complicated system of tissues, glands, organs and nerves, pulsing together as an interconnected web of urgencies. The urge to breathe, for instance, is a compulsion that evolved around the need of your cells for oxygen (and to blow off carbon dioxide); breathing is an urgency. Many other urgencies are presently taking care of what this animal nature of yours requires to live. Like other animals, you possess an instinctive intelligence that has been evolving for millions of years and across numerous species. Through a network of impulses, reflexes, drives, and adaptive routines instinct serves to uphold a dialogue between the internal urgencies keeping you alive and the larger rhythms of your external environment. The cycles of Sun, moon, and seasons are intricately timed with your needs for activity and rest, arousal and reproduction, nourishment and shelter. You don’t have to think about this provident coincidence since the urgency that anchors it in your throbbing viscera is unconscious and graciously impersonal. From the stage of your body, reality is physical, vibrant, sensual – and alive. Since everything in you and around you is caught up in a pulsing tango (and tangle) of urgency and rhythm, from this vantage point nothing is inert or uninvolved. Colors, sounds, odors, flavors, temperature, current, texture, pressure and weight: a kind of glory cascades across the dazzling variety of forms, effervescing to the surface and dancing on your senses. It’s not you over here and that over there, but you and that together, partners in the same cosmic dance. At this stage religion is animistic, connecting and closing the circuit between the inner mystery and outer cosmos by a mythology of hidden agencies. Anima is Latin for vital force or life-force, a related term to spirit, meaning breath. It’s not that something else is on the other side of what we perceive with our senses, but rather that what we perceive with our senses participates in and manifests forces that hold everything together. Again, these are not supernatural personalities (deities) pushing things around (that idea comes later) but creative energies expressing outward from the interior of things. In addition to being an animal and having an animal nature, you – and this especially refers to the you you think you are – are an identity project of your tribe. Ego is also from the Latin, translating as I, the subjective center of a separate self. You needed this separate center so your tribe could shape an identity around it and assign your place in the larger role-play of society. For this to happen with reasonable success, your animal nature (body) needed to be trained (i.e., socialized) to behave properly – not to bite, pass gas, or mate in public. In addition to such constraints on unacceptable behavior you were conditioned by your tribe to be polite, cooperate with others, and pick up your toys. All of this social shaping of identity (ego) is what we generally call morality. The individual is expected to follow the rules and respect authority, and not only because those in charge have their hands on the carrots and sticks. It just makes for an easier life together in community. Your tribe dutifully (but not always very competently) instructed you with the preferences, values, and beliefs that demonstrated obedience. Because all of this happened in the first decade or so of your life, the part of your personality where these moral sentiments and reflexes still reside is known as your inner child. Most of what goes on in there is deeply conditioned but nonrational – prompted and carried along on scripts of flattery and shame, praise and blame, guilt and appeasement. Another strong virtue of early childhood was your gift for fantasy. Daydream, dress-up, role play and pretending to be someone (else) occupied much of your time. Fairy tales and closet monsters were sources of endless fascination or bedtime anxiety. Fantasy is your creative intelligence for making things up and acting as if what you can’t see is more real than what you can. Your tribe exploited this native ability of yours and got you invested in the collective fantasy of meaning-making, producing a kind of semantic shelter in the world you shared. As long as this world-construct was confirmed and reinforced in the habits of everyday life, the illusion of its reality could be maintained. Religion at this stage is theistic (from theos, god) referring to the belief in higher powers that model human character and supervise the world from the margins. When you were a child these higher powers were literally your “taller powers” – i.e., the adults who were in charge of things and provided for your needs. Theism postulates (but doesn’t prove) an intention behind and above the world, representing an important advancement on the spontaneous and impersonal life-force of animism. The gain was that theism introduced the notion of there being a plan and purpose in the nature of things that we can interrogate, petition, and perhaps even influence for our benefit. Currently, and for the past several millenniums, human beings have been comfortably established in second-stage culture and religion. The reason is simply that ego has been the dominant mental location of human consciousness for that long. Theism, as the religious system coordinating deity, tribe, and ego, has provided orientation and meaning to our species for a long time. Until fairly recently, that is, when our cosmology (scientific model of the universe) began to render the old myths unbelievable. When one stage is passing and before the next stage is fully entered, the phase we find ourselves in can be very disorienting. Once-true believers lose faith, members leave their churches, denominations don’t seem to work anymore, and the “spiritual but not religious” look for inspiration from other sources. We can also see the endangered religions growing more desperate and violent, putting up their defenses and terrorizing nonbelievers. It is tempting to conclude that such is the nature of religion itself, and that we will be much better off without it. To understand the third stage of religion, however, we need to look beyond the anxiety, hostility, and depression of the disoriented ego. Your inner child is not capable of creating the life you really want. It’s not only stuck in the problem, it’s where the problem is centered. What you really need is to ascend to the mental location of your higher self – rational and responsible as an adult ought to be, but also emotionally balanced and intellectually engaged. You don’t need to leave your passion and creativity back in childhood (or repressed in your personality). What is soul? Let’s first say what it isn’t, exposing some popular efforts to hang on to ego. It isn’t a ghostly replica of the body’s physical form, and it’s not another word for the immortal ego. Soul isn’t what continues on after you die, as a disembodied personality moving residence to the next earthly incarnation, new celestial home, or some metaphysical higher plane. All of these explanations are trying to figure out what happens to you when you die, when you – again, at the mental location of ego – are nothing more than a temporal construct of social roles, attitudes, and beliefs. Your third-stage challenge is to open yourself to a post-ego way of being, where “me and mine” are no longer anchors of ultimate concern. The “post” in post-ego – as well as in post-theism, the religion of our third stage – doesn’t require that you renounce your ego, throw it down, or try to stomp it out of existence. It simply means after, referring to a way of life oriented on the essential realization that All is One, which logically comes after the illusion of your separateness (ego) has been transcended. In the light of this realization you instantly understand that you, as an individual, are a participant in the larger communion of beings. Morality is no longer about obedience to another’s command, but is rather about making choices and taking action with a much (much) larger context in mind. Notice how this insight marks an advance beyond the animism of Stage One, where the emphasis was more on the peculiar manifestation of the life-force in a tree, a thunderstorm, or in the body itself. This is the difference between instinct (unconscious, compulsive, urgent) and wisdom (fully conscious, contemplative, intentional). A higher capacity for holding the awareness that All is One had to wait on the ability to open your mind without losing it, to detach your focus without getting distracted, and to jump from your highest thought into the mystery encompassing all things. This rings true for me, the intention part for sure. I no longer want to buy products in which I know are produced in a manner which is disrespectful or cruel to people (labor) or animals. it is simply a quiet decision, and if I can no longer get that product using this standard then my taste changes. I am much less consumer oriented these days. I have all I need. A roof, food, family/ friends, books and pets.